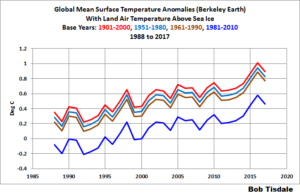 Most of us are familiar with the World Meteorological Organization (WMO)-recommended 30-year period for “normals”, which are also used as base years against which anomalies are calculated. Most, but not all, climate-related data are referenced to 30-year periods. Presently the “climatological standard normals” period is 1981-2010. These “climatological standard normals” are updated every ten years after we pass another year ending in a zero. That is, the next period for “climatological standard normals” will be 1991-2020, so the shift to new “climatological standard normals” will take place in a few years. But were you aware that the WMO also has another recommended 30-year period for “normals”, against which anomalies are calculated? It’s used for the “reference standard normals” or “reference normals”. The WMO-recommended period for “reference normals” is 1961-1990. And as many of you know, of the primary suppliers of global mean surface temperature data, the base years of 1961-1990 are only used by the UKMO.